The Toltec Mounds Archeological State Park provides testimony to this region's appeal since prehistoric times. Where the foothills of the Ouachita Mountains step down to meet the flat farmlands of the Delta, central Arkansas is now home to over a half a million residents. 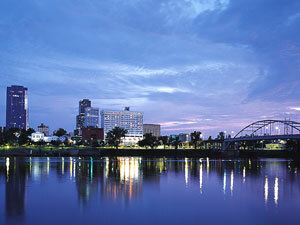 Centered around the capital city of Little Rock, the area is bustling with nightlife, museums, art galleries, festivals, fine lodging and plenty of shopping connected by the River Rail Electric Streetcar system. When you're ready for some fresh air, Little Rock's Riverfront Park, situated along the Arkansas River, is over 17 acres of recreational space including a 1,200-seat amphitheater and historical pavilion. The Clinton Presidential Library is situated nearby in a 30-acre city park. Just a short drive northwest, the Pinnacle Mountain State Park offers a panoramic view of the regional peaks and river bottomlands. Bring your gear and enjoy biking, hiking, golf, tennis, fishing, canoeing, kayaking and more in the vital Arkansas heartland.